Bosses at British Nuclear Fuels (BNFL) will meet this Thursday to agree the sale of its US subsidiary Westinghouse, which builds nuclear power stations. According to the Financial Times, Japanese conglomerate Toshiba has won the auction with a $5bn (£2.8bn) offer. It said Toshiba had beaten bids from US group General Electric and Japanese rival Mitsubishi Heavy Industries. More countries are looking at nuclear energy as they look to tackle rising fuel costs and cut carbon emissions. Engineering group Toshiba makes a range of products from hi-tech memory chips and flat-panel TVs to heavy plant machinery. It already designs and builds nuclear power stations in Japan, but a deal for Westinghouse would enhance its chances of winning contracts overseas. "Nuclear power generation is said to be vital to support power demand in such fast-growing countries as India and China," said Takeo Miyamoto, an analyst at CLSA Asia-Pacific Markets. "The deal would help heighten Toshiba's chance to win contracts in those nations." Toshiba is expected to invite a US partner to take a minority stake in Westinghouse, possibly engineering group Shaw. Westinghouse was bought by BNFL for $1.1bn in 1999. It employs 9,000 people and has annual sales of about $1.8bn. The Westinghouse sale will provide a windfall for the UK Treasury. But industry experts have expressed concern that such an asset is being sold off when the demand for new nuclear power stations is set to surge. The UK government has just launched a three-month public consultation into the UK's future energy needs and has asked the Health and Safety Executive to examine the safety, cost and suitability of the country's existing nuclear power stations. 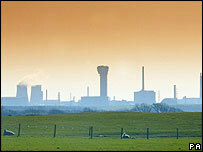 State-owned BNFL operates four active UK power stations and seven that are being decommissioned.